In fact, the trailing car is not always responsible for a rear-end collision—though they often are. Instead of assigning guilt this way, a lawyer will need to carefully examine the surrounding circumstances. Florida, like all other states, requires that motorists operate their vehicles in a reasonably careful manner. This standard does not require that motorists be perfect. However, they must exercise ordinary care. These drivers often collide with the vehicle in front of them, causing a rear-end collision. However, these drivers are at fault for the collision not simply because they were the trailing car but because they operated their vehicle carelessly. In other words, the driver was negligent and therefore responsible for the crash. In these situations, the lead car driver has not operated their vehicle in a sufficiently careful manner, which means they are negligent and responsible for the crash. Florida law also recognizes the concept of comparative fault. This means that both drivers can be negligent and contribute to an accident. If so, each driver might have a valid claim with the other driver’s insurance company. 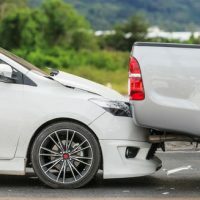 In Florida, the amount of compensation you can receive will be reduced by your own percentage of fault for the rear-end collision. For example, if you suffered $30,000 of damages but are 40% responsible for the crash, then you can only receive $18,000 in compensation. If you were 70% responsible, then you could only receive $9,000 in compensation. One reason the trail car is so often found responsible is that there isn’t any evidence that the lead car did anything wrong. In the absence of any evidence, people will fairly assume the car that struck the lead car is responsible. However, you might be able to show that the driver in front is at fault. For example, dash cam footage can show a driver slamming on the brakes or stopping to execute a turn without using a turn signal. You might also be able to inspect the car to show that the taillights were burned out. Lastly, the driver might also admit to these actions. Earnhart Law has been representing auto accident victims for over 30 years. Our detailed approach to the law has yielded tremendous dividends for our clients. To speak with one of our lawyers, please schedule a free initial consultation by calling 561-265-2220. Avoid delay.